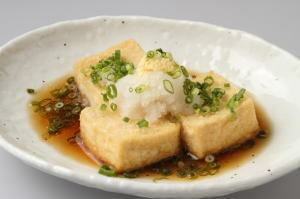 Agedashi Dofu ('揚げ出し豆腐', is classified into appetizer), is known as Deep Fried Tofu with Soup Stock in English, and 扬出豆腐 (Yáng chū dòufu) in Chinese. It is the washoku. Agedashi Tofu, Fried Tofu with Soup Stock, Deep-fried Tofu in a Soy-sauce-flavored Sauce. Bean Curd, Potato Starch, Oil, Soy Sauce, Dried Bonito Flakes, Sugar, Salt, Nori Seaweed. Japanese Leek, White Radish, Green Perilla, Ginger, Vinegar.